Our kitchen table on any given night. It has been another wild week at camp cajun mama. Obviously as I am a little behind on blogging. I got the cooking bug on Monday and literally spent all day in the kitchen. Yesterday I spent the school day helping out at the kiddos’ school in the library. Their librarian is the sweetest person and it is book fair time so I figured why not. I got to interact with so many of the sweet kiddos and see their little faces. I love it when they say “hey you are so and so’s mom!” And their face lights up. Not sure I have ever seen people that happy to see me so it’s a win win. Anyway, I apologize for once again falling behind, but I am here now and plan on getting several recipes in. 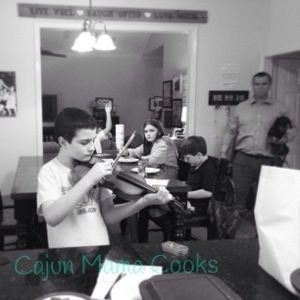 Sometimes the mama part of Cajun mama takes over and I have to handle up on my mommy duties. I am writing this sitting in the parking lot at their school waiting for my son’s strings performance to start. A mama’s got to do what a mama’s got to do, right? 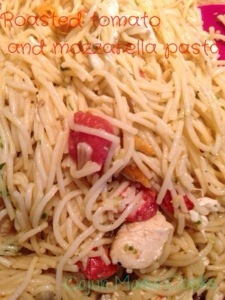 So, on to more important things…this pasta. Oh y’all…this pasta is so delicious. Full of flavor and easy to prepare and just so filling, it is a sure fire winner. I loved knowing that it was chock full of cherry tomatoes and all of the vitamins and good stuff they contain. Also, You can add chicken to this dish or you can leave it out making it a great meatless option. I saw this recipe on Pinterest and knew I would love it and had to make it ASAP. My friend came over for a visit and I decided to throw it together. She loved it. I loved it. Big Daddy…loved it. Even 2 of my kiddos gobbled it up. Yummy noises all around my friends. So grab yourself some cherry tomatoes and pasta and get to cookin. You will be so glad and the yummy noises will be yours!! Preheat your oven to 425 degrees. We are going to roast us some tomatoes. (See above pic) I covered a baking sheet with foil. Now lay your washed and dried tomatoes all out on the foil. Now sing to them and let them know they are going to be so delicious roasted and they need not worry. What? You don’t talk to your food as you cook it? You are missing out! (Don’t judge me…I am tired a lot of the time and drink too much coffee). Sprinkle the little darlings generously with the Olive oil. Don’t hold back now. 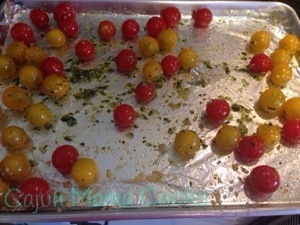 Now sprinkle some kosher salt and pepper then using your hands give those little tomatoes a nice rub down. Lol. Add the garlic and basil. Do the same. You just want to make sure all the tomatoes get some of that flavor. your pasta. Pop them in your preheated oven and roast them until they are literally bursting with flavor. The smell alone coming from your oven will have you salivating. About 25 minutes give or take should do you good. While the tomatoes are doing their thing, go ahead and boil your pasta. Reserve the liquid for use in the dish later as it helps to thicken up the saucy sauce. Next, season the chicken with salt and pepper. in a skillet, heat some olive oil over medium heat. Add the chicken to the skillet and cook until browned on both sides and cooked throughout. Add those beautifully roasted tomatoes to the chicken and cook for 2 minutes. Pour the cooked pasta into the skillet with the tomato chicken mixture and add about 1/4 cup of the reserved water and cook over low heat until sauce is thickened. Stir in more reserved water as necessary to coat all the pasta. Cut the fresh mozzarella into 1/2″ chunks. Stir into the pasta and toss around until the cheese is slightly melted. Season to taste with extra kosher salt, pepper, and extra basil. Serve the pasta up in bowls and sprinkle with Parmesan cheese as desired. Y’all are going to flip!! This is one of my new favorite dishes. Manga! Heaven in a pasta bowl. It’s even good cold.